First up was getting Gordon ready. Here he is with my final block painting. 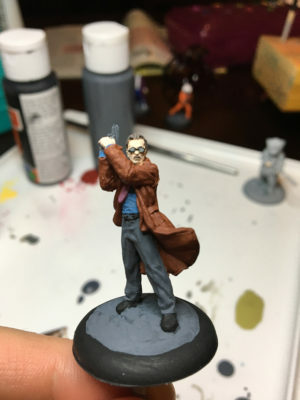 I threw a dark wash on him after to give him a little more depth. 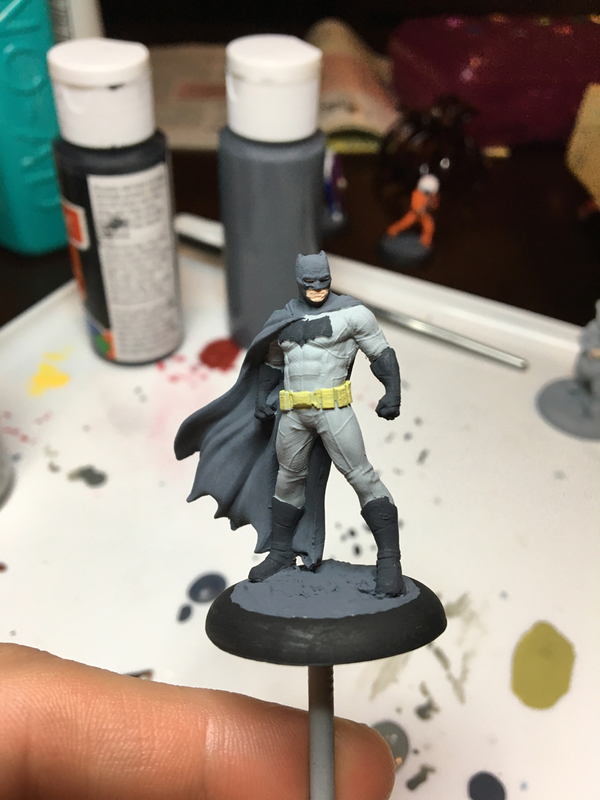 Next, Batfleck joined the ranks. Again, a final wash happened later. 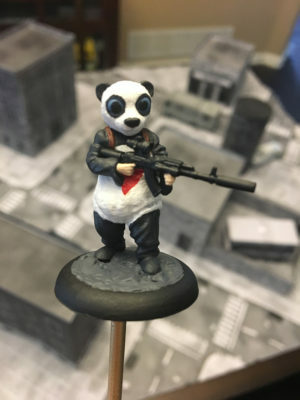 And finally, Pandaman gets a paint up to join my Joker crew. Dark wash came later. I think this is my favorite mini from the Suicide Squad set as I really like the Panda + Assault Rifle juxtaposition. I immediately thought he was a great character to add in the movie and works well in miniature. 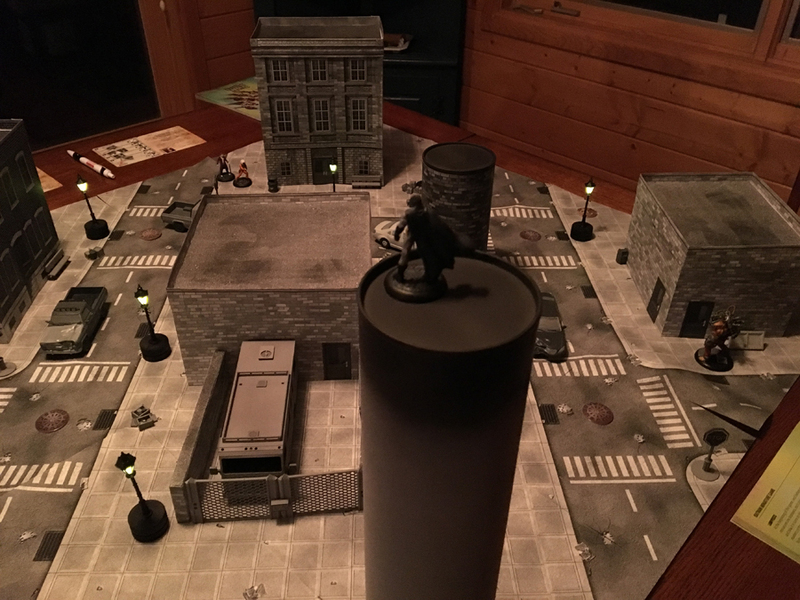 We can’t play on a bare table, now can we? 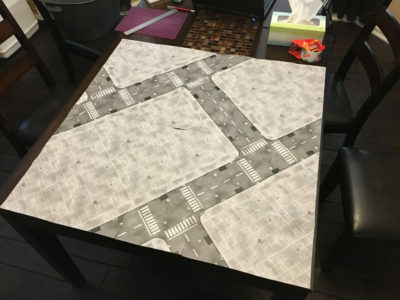 So I printed out a bunch of tiles from my Fat Dragon city pack and taped them together in a modern, diagonal setting (something I’ve been seeing more and more of and really like the aesthetic). 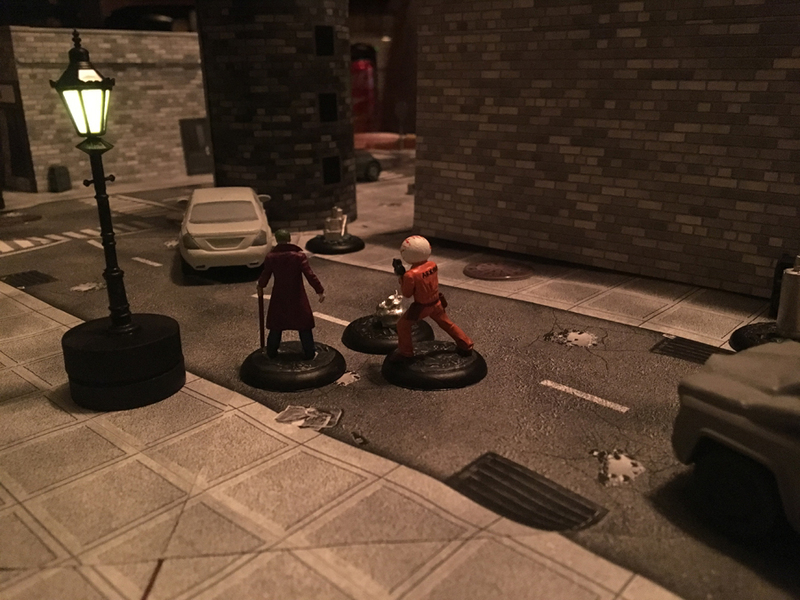 For the game, I don’t recall the scenario but in the end, we had to heavily modify so I’m not sure it mattered. We ended up doing another 150 point game so I grabbed the same Joker (Leto) + Eyeball Man and Colton wanted to see Bane in action after he painted him up. Using out new light-up lamps, we played around with some photo ops before we began the game in earnest. As you can see, I’m leaning heavily on my B/W Walking Dead terrain. 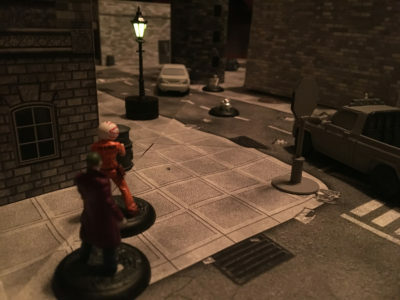 We set up the board with my Joker crew on the left and Bane on the right. Batfleck swoops in to watch. 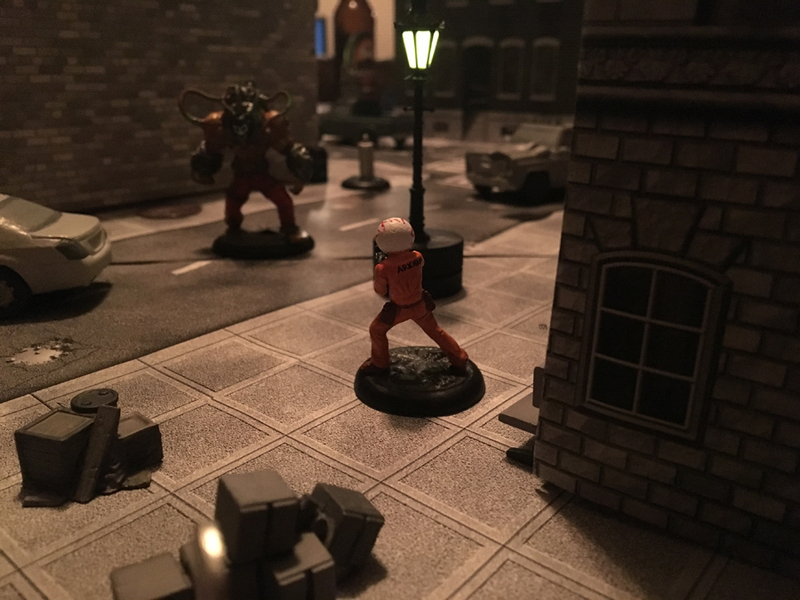 We have objectives in the central area as we realized pretty quick that Bane likely can’t win an objective-based scenario all by himself and the game would quickly devolve into a pretty lame experience. After looking at everything, I’m still a little worried it won’t be a very compelling game with this set up but we push on. 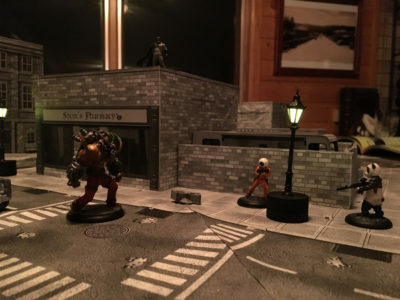 I start out by quickly running to one of Bane’s cash objectives. Eyeball Man picks it up for one victory point at the end of the round. 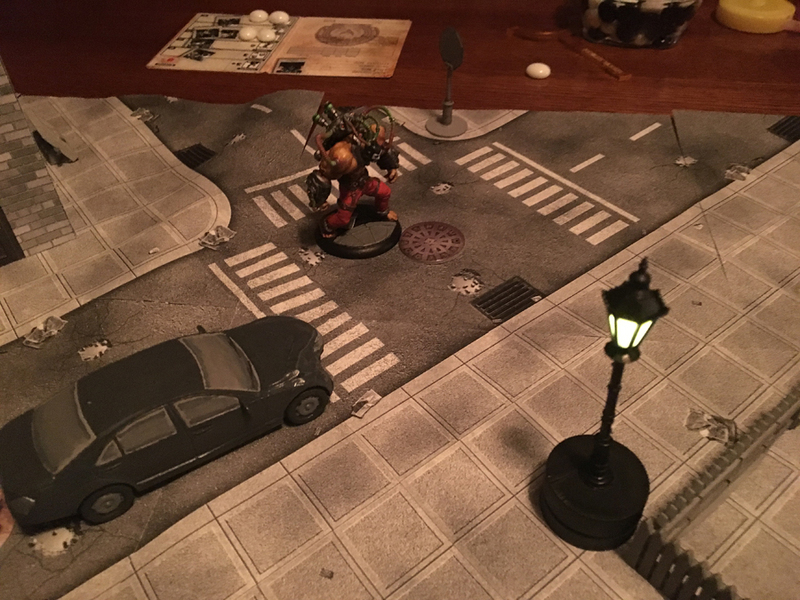 Colton decides that Bane will take too long to cross the board on foot and descends into the sewers. This creates a pretty weird game where Bane does nothing first turn, will spend a whole second turn in the sewers, and then finally act in round 3. Joker (Leto) also has a power to remove an opponent’s initiative chip from the round bag, shortening our six round game to five. 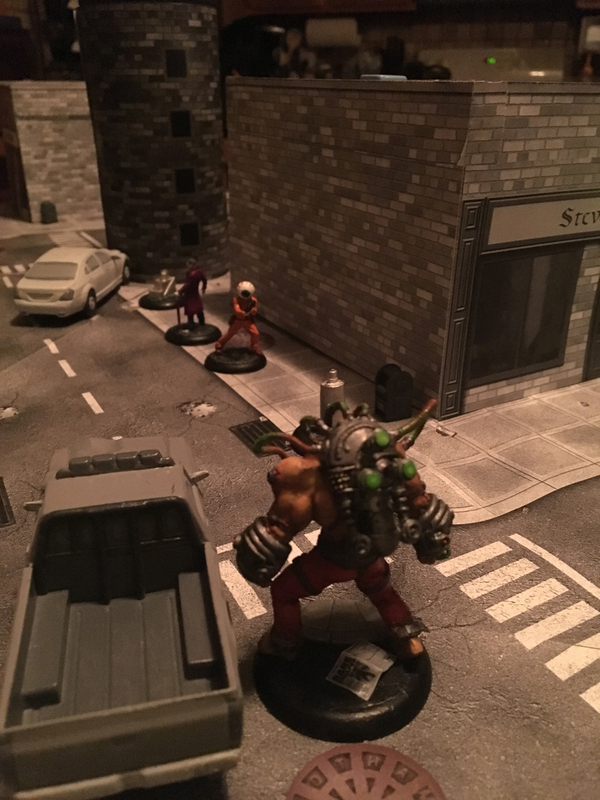 40% of the game, Bane will spend in the sewers. We’ll see if it pays off. Bane’s sewer ploy does create an interesting dilemma where I could go run around and get objectives but that would likely split my forces and Bane could pick me apart. If Bane focuses on Joker, I’d likely lose quickly. 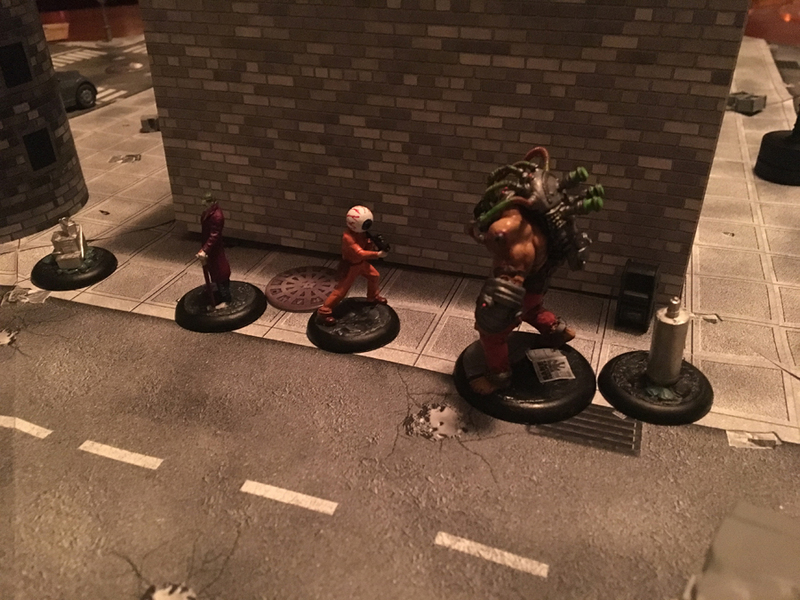 I opt instead to force Bane to enter in a way that will force him to engage Eyeball Man. 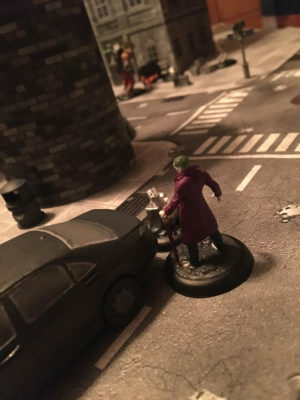 I block the closest Sewer grate with both figures (necessary since Bane is a big model) and have Joker (Leto) on the side with the car blocking any straight attack vectors. As predicted, Bane enters round 3 on the opposite side with initiative. 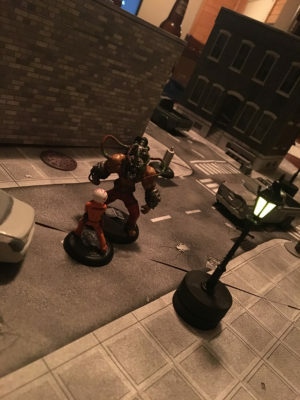 But Bane falls just short of being able to engage Eyeball Man directly due to having to spend some counters moving out of the sewer. 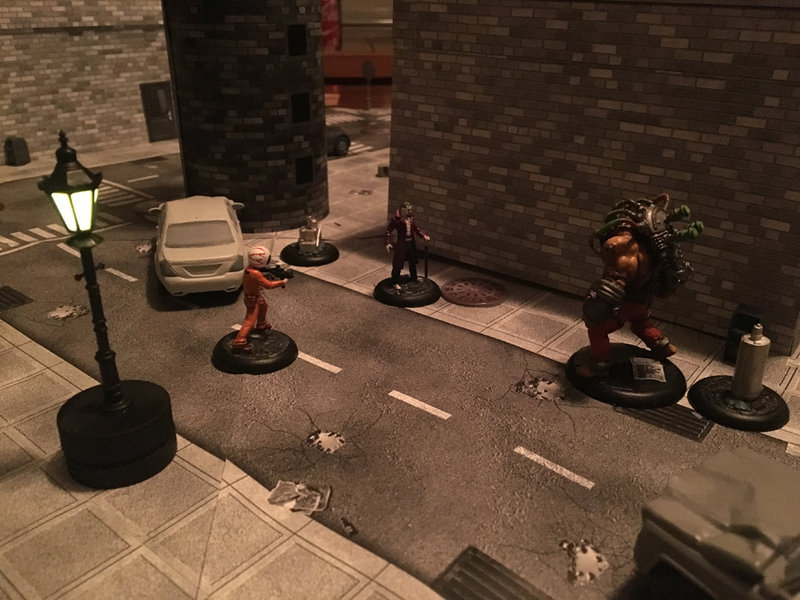 With so few rounds left, Bane is also Titan Dosing every turn. Luckily, there is a Titan Dose objective of his right near me so he can start earning VPs as well. 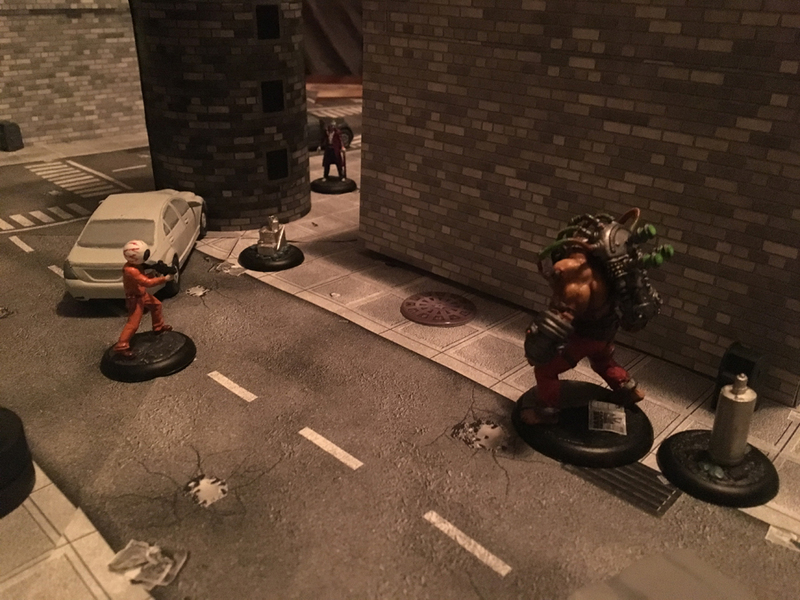 I have a pretty good position so I decide to see just how tough Bane is. Eyeball Man unloads three shots into him and hit once. 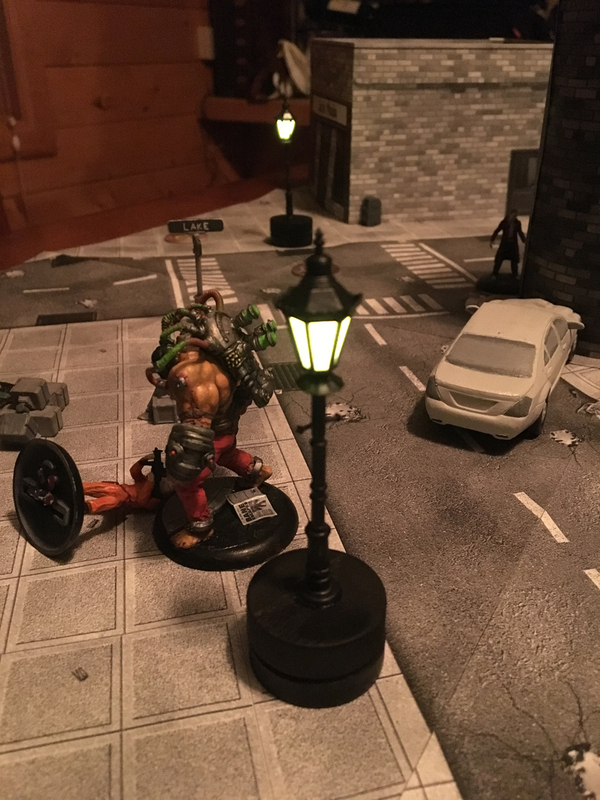 Bane takes a wound. Good thing he has… TEN Endurance. Ugh. Maybe Joker can do better. Nope, Joker misses all three of his shots. Bane has 9 life left and I just unloaded with about the best I could do. Valor was never a villains strong suit anyway so time to switch tactics. I did have the decision that I could have stood my ground and with a 50/50 chance of getting the next activation, try this whole “shoot the big guy” strategy again but I didn’t want to risk it. 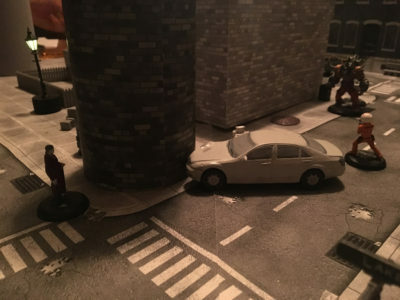 I would have needed to hit with all my shots in the next in round in addition to winning initiative and I just didn’t see that happening after going one for six shots earlier. I end up getting initiative anyway. I stay the course though and leave Eyeball Man as fodder for Bane and move Joker further out of the way. 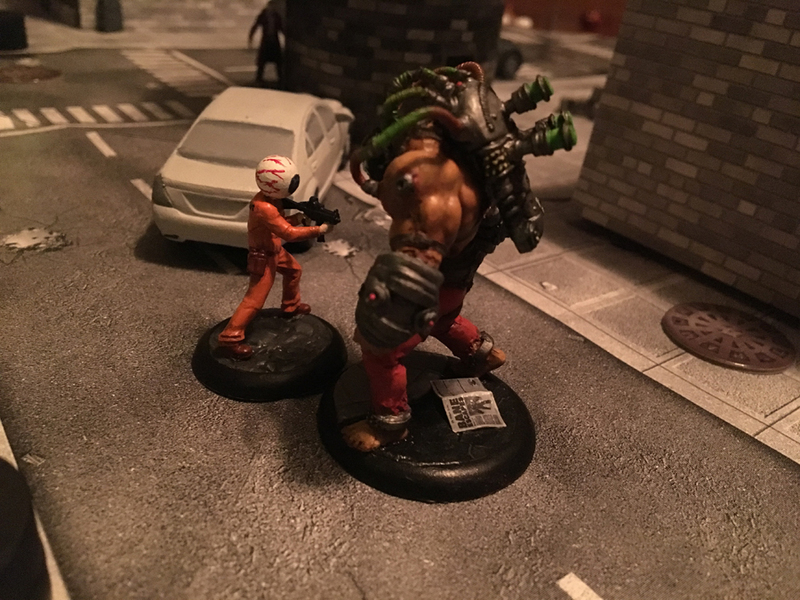 Bane goes after the easy Eyeball Man target. Bane inflicts 2 damage on Eyeball Man but doesn’t pull off a pin. 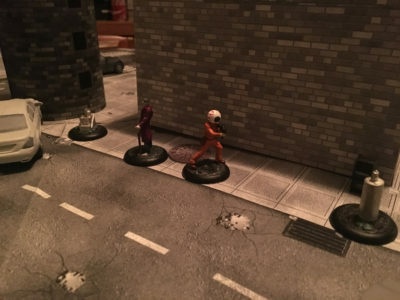 Eyeball Man is only able to use his activation to move further away (he’s been carrying Bane’s Cash objective the whole time so his action are limited). Bane gets the initiative in the next round and engages Eyeball Man again. This time, Bane does was Bane does best and smashes Eyeball Man unconscious. I then have Joker get to my Ammunition objective and end the game 5 VP to 3. We didn’t really think this could go any other way unless Bane could have gotten a hold of Joker and pounded him down. 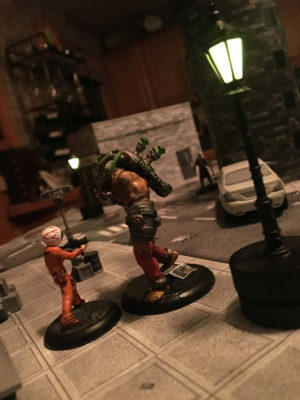 While the game was pretty pedestrian in the results, it was good to see that Bane didn’t just keel over from a hail of gunfire and that having him catch you wasn’t an automatic death sentence. 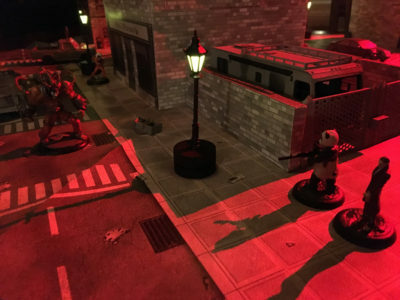 For future games, we’ll take into account the fact that some of these 150 point demo games likely can’t be used in a real scenario objective game. We’ll probably need to bump up the points to 200 to get a little bit more strategy involved.